The Partagas Londres Finos is of Petit Corona format, 40 ring gauge and 5.1 inches (129mm) in length. Discontinued in 2002, it is an aged cigar presented in a dress box where each cigar is individually wrapped in cellophane. Being aged, it is a very creamy cigar, pretty strong and intense in flavors. 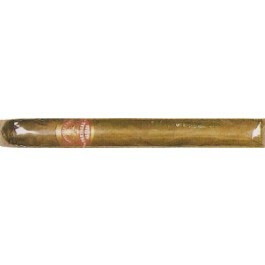 Medium to full bodied cigar, it is a very rich cigar in terms of flavors. Lots of coffee, wood, spices and some delicious creamy and sweet flavors, almost like pastries. The construction of the cigar is also flawless, amazing draw from the first to the last third. And a beautiful look, the wrapper has a nice dark brown color, with an appealing woody smell. Very good Partagas, strong yet very creamy. The Partagas Londres Extra has great quality to price ratio. • A great medium to full body cigar. Rather complex cigar, with lots of woods flavors, and some creamy flavors such as coffee, caramel and cocoa. • This is an aged cigar (at least 13 years of age). This Partagas is a great classic Partagas. Get it while you still can. The cigar is looking pretty appealing thanks to its rustic and aged look. The wrapper has a nice dark brown color, slightly shiny and oily. There are no tear or sign of cracks on the wrapper. The wrapper smells of woody tobacco. Once cut, the draw is a bit tight at the beginning but it will open itself up along the cigar and remain perfect until the end. The first third starts off with some beautiful aromas of leather and wood. The wood flavor is rather light at the beginning, but soon ramps up and evolves into a full woody flavor. Overall, the first third is of medium to high in strength. There are also some notes of sweetness, creaminess such as cinnamon, caramel and of coffee. In the middle third, the flavors are becoming more powerful and more pronounced. However, no flavor is overshadowing any other; the flavor mix is great and allows us to enjoy all their nuances and their complementarity. The cigar is now closer to a full body cigar. In the final third, the flavor profile remains similar. The strong wood flavor is still very dominant; there is also some delicious Cuban tobacco. The strength is still in the same medium to full range. And the perfect construction of the cigar allows it to be smoked down to the nub. In summary, it a small wonderful cigar that packs a strong mix of flavors.